This is my favorite recipe for any of the meats that need to be cooked longer to make them tender. I always use grass-fed and pastured meat. Not only is this recipe great with beef, but I love it for lamb and pork roasts as well. I originally got the recipe from Simply Recipes and modified it. While the original recipe uses boneless meat, I use bone-in and boneless meats alike. If you are using grass-fed and pastured meats, the original recipe cooks the meat way too long because grass-fed meats are leaner. If you are using conventional, grain-fed meat, add about 30% to the cooking time. 1. 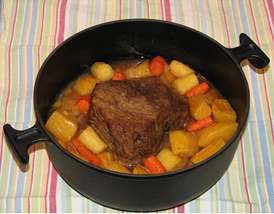 Use a Dutch oven or other pot large enough to hold the meat that has a tight-fitting lid. While heating the oil on medium heat. Rub the meat with the salt, pepper, and Italian seasoning before browning on each side for about 5 minutes. Don’t move the meat while it is browning. 2. Once the meat is browned on all sides, lift the meat up and distribute the onions and garlic under the meat. Place the meat on top. Add the stock or wine. Cover with the lid and turn the heat down to low and cook for 2 to 2 1/2 hours. Use less time for smaller amounts of meat and more for larger cuts of meat. Note: check on your meat after an 1 1/2 hours. If you have a tight-fitting lid, there should be more liquid in the pot than just after you added the liquid. If not, add another 1/2 cup of broth or water. 3. For the last 10 minutes, add the vegetables. 4. Remove from heat and rest the meat for 5 to 7 minutes before serving.